The Udacity lectures featuring Steve Blank on new venture creation are serving as a kind of textbook for my “flipped” graduate arts entrepreneurship class. Blank’s entrepreneurial process, shared by others in the lean start-up movement, advocates for getting a minimum viable product (MVP) out to its customer/audience as soon as possible in order test hypotheses about the product and to minimize risk (if you fail early, you fail cheap). 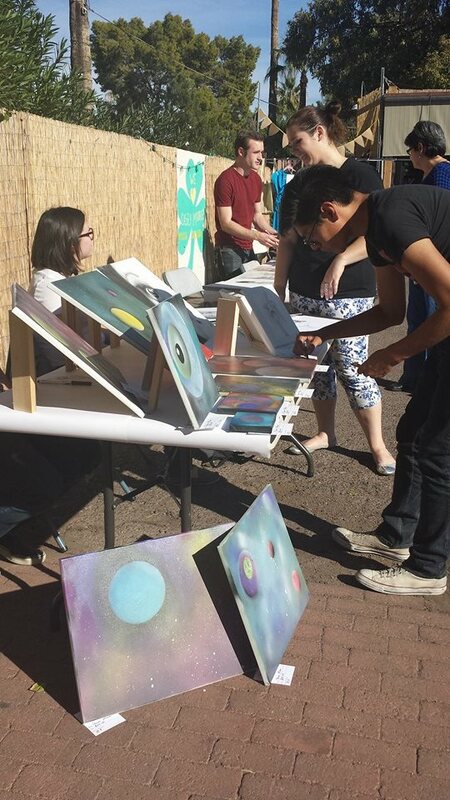 My students, each one an MVP of the other kind in my book, launched their MVP on Saturday: SAM Student Art Market. Once the students selected a date for their prototype event, they quickly translated their theatrical production experience as dancers, actors, designers, managers, and directors into the context of their prototype marketplace: these people got it done! They organized the space, procured the supplies, finalized the partnerships, recruited the artists and craftspeople, marketed, tracked expenses and revenue – they did it all – and in a very short amount of time. Most of the semester has been about translating the “business” of entrepreneurship into an arts context, but for the past three weeks, I witnessed the translation of their artist/producer skills for the business context. They capitalized on their existing knowledges, skills, and abilities, embodying the effectual approach to entrepreneurship that has been a through-line all semester. We don’t meet as a class to debrief for a few days, so won’t do that here just yet (come back later in the week), but you can read one participant’s perspective on the course blog. This entry was posted in Arts education, Arts entrepreneurship, Higher education and tagged entrepreneurship, SAM, Steve Blank, Student art market. Bookmark the permalink.